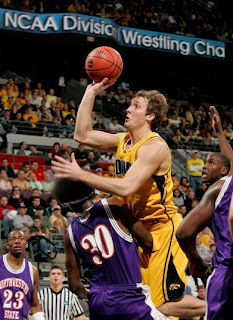 Congrats to Adam Haluska, who became the first Iowa Hawkeye to be selected in the NBA Draft since J.R. Koch in 1999. Adam was taken in the second round by the New Orleans Hornets. I'll need to go back and revise the stats in my Steve Alford War Criminal. Nice job Steve! Oh wait, he wasn't even one of your recruits.